(file photo) (l-r) Norwegian investor Mr. Christian Wienpahl, Mrs. Hedda Wienpahl and Premier of Nevis the Honourable Joseph Parry. NIA-CHARLESTOWN, NEVIS (June 27TH, 2011) — “You see signs of life. You see signs of economic activity,” said Nevis’ Premier and Minister of Tourism, the Honourable Joseph Parry, as he spoke, with pride, about developmental projects taking place in the Cades Bay area. 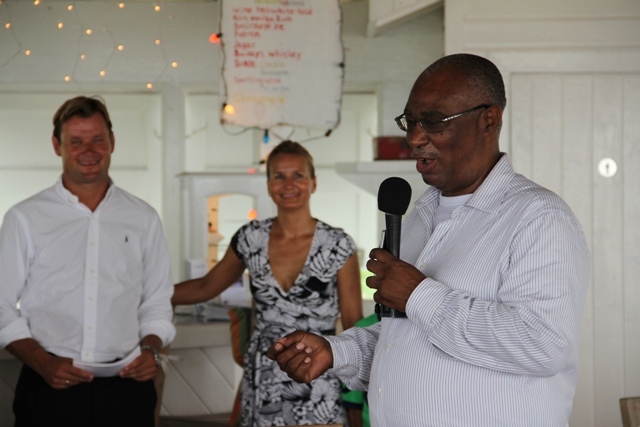 Premier Parry’s remarks, made during a recent edition of his weekly radio show “In Touch with the Premier” and on June 22 during a live address to residents and citizens of Nevis, lauded the entrepreneurial pursuits of local businessmen Mr. Gregory Hardtman and Mr. Deon Daniel and Norwegian investor Mr. Christian Wienpahl. These investments, Minister Parry explained, reflected “a type of up-market tourism” that was soon to be launched on the island. In addition to recording his administration’s support of the projects, the Tourism Minister said he was pleased that local and foreign investors had high confidence in Nevis’ economy. “What is pleasing to me is that the activities are done not only by foreign investors but by local investors too and it is important for me to make that point because investors are investors. 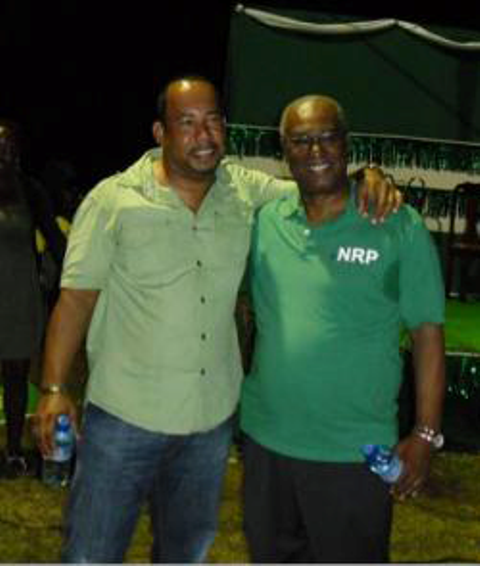 (file photo) Premier of Nevis the Honourable Joseph Parry with local investor Mr. Deon Daniel. “It’s [Cades Bay] one of the most beautiful areas on the island of Nevis and a tremendous lot is happening there,” he said. Investor Hardtman, according to Premier Parry, plans to produce “Tamarind Cove Marina Development Limited” with its major highlight being “The Residence at Tamarind Cove” while Investor Daniel is in the process of developing phase two of Nelson Spring Beach Villas and Spa and Mr. Weinpahl has already started work on his project: Zenith Nevis. “Christian, I wish you well. I am very happy that you are employing a local contractor and will bring jobs to local persons. “We have Mr. Deon Daniel who has Nelson Spring phase one where he has 52 rooms, and he now has plans to build another 102 rooms with what he calls Nelson Spring phase 2 and he has actually started construction already and again, people are employed there. “Mr. Greg Hardtman has told me, just recently, that he’s putting down over 40 rooms or villas in the same Cades Bay area along with his plans to have a marina sometime later down the road,” Mr. Parry explained. 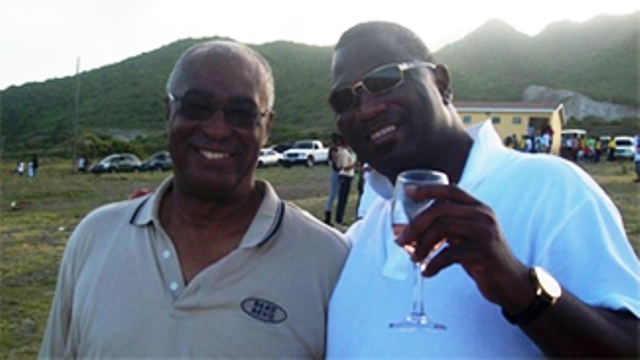 (file photo) Premier of Nevis the Honourable Joseph Parry with local investor Mr. Gregory Hardtman. “There were many more projects taking place on Nevis,” Premier Parry said as he spoke of the benefits of the Sea Bridge pier, the construction of the Aman Hotel and the development of Nevis’ capital city. He encouraged Nevisians to remember that “the recession is not over” and as such, they should unite to continue the development of the island. “Let us not think that the recession is over, it is not over and we have to continue measures here on the island of Nevis as well. We can’t wait for somebody to solve the problem for us, we have to solve the problem ourselves,” he said. In addition to his post as Premier of Nevis, the Honourable Joseph Parry holds responsibility for tourism, finance, education and library services, economic planning and statistics and human resources.